Last week I attended the 2012 ICT Inspire Innovate : Think Digit@lly,Teach Cre@tively & Transform Ped@gogy Conference (boy what a mouthful). This was run by the Department of Education -South Western Sydney Region. A huge range of workshops and provocative keynote speakers. It was a credit to the organisers. 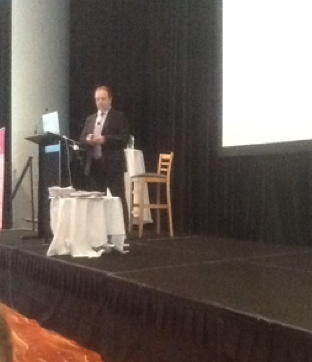 The aspect that really got my attention was the keynote speaker - Gary Stager. I hadn’t come across Gary before but had vaguely heard of some of his work. An American, who worked with a number of educational bodies worldwide. He had initial helped set up Australia’s first one on one laptop program in Melbourne in the early nineties. From the opening comments - this guy had me hooked. How - why did this guy appeal to me ? First of all he had a rounded view of education. Quite often technology driven educators start with the technology and the technology is the main aspect of their theory. Gary had a more rounded and inclusive view of education. The computer was just a tool (an essential and powerful tool - yes - but just a tool) to bring about meaningful learning. He started from a platform of what he called “The Best Ideas in the World”. This combined a number of theories (some of them - nothing to do with technology) - such as Reggio Emilia , El Sistema, One Laptop, Big Picture, 826 Valenca etc. He came across as - what I call a “Humanist” educator. By this I mean an educator driven by the thought process. Generally emphasising literature, poetry, arts, maths and Science. Generally considered old fashion education that has nothing to do with the “job” or “business” or short non-thinking type courses that education seems to heading towards. “If we teach them to think - how is that going to get them a job or give them a specific skill ?” As far as I can see - we can NEVER teach them what they need for a job. The present generation will have have 15 different jobs and will work at jobs that haven’t been invented. So what can we give them ? The ability to think, organise, adapt, resilience, create and a love of learning. I recently read the Steve Jobs biography and one of the things that hit me about him was that he was this sort of thinker. He wanted his objects to be as beautiful on the inside as out. He wasn’t just a computer geek (in fact he wasn’t one at all really) but had an interest in the artistic side of life as well. Gary Stager was quite a provocative speaker. A lot of what he said would challenge a lot of people. But he also made no apologies regarding his views. To give him credit - I think he has seen enough different educational settings, over a range of years to be able to make some conclusions about certain pushes in education. He was an advocate of “project based learning” - but projects had to be meaningful. He meant to the students. He was critical of the Apple approach to Challenge Based Learning. How many 10 year olds would really be interested in, or relate to “How can we make our city water supply better ?” The project had to be student based - not something grand and airy-fairy. The best example I can think of is, recently my wife was in charge of her school’s Harmony Day activities (Harmony Day is a national push each year in Australia - to try and highlight inclusiveness and celebration of our cultural diversity). For weeks leading up to it the Stage 3 (10-12 yr olds) students and her ESL students planned, organised and prepared for the day. They wrote and presented speeches, made posters, collected and practised games, organised the school in multi-aged groups. When the day arrived - it was totally student run. Students gave speeches, ran games and activities for the younger students, supervised and organised. The sense of achievement and pride of what they had done would last with them for life. It did involve some technology - but was a natural aspect - which required a purpose. Project based learning that was relative to them. This was the main point Gary Stager was making. Projects make memories. Gary was also against National Curriculum’s. It narrowed education. A National Curriculum has been advocated for a number of years in Australia and will come to fruition in the next couple. He had many interesting comments to make regarding the one on one laptop program 20 years on. A few findings I found surprising. * He emphasised that the creativity was in the software. The computers had to contain multimedia software that would enable the students to create - not an emphasis on network and wifi. He wasn’t a fan of ipads. To him - they were more a consumer device than a creative device. * Laptops had to be given to all cohorts at once. Not a half grade here and half a grade there. One grade all got them - the other grade waited. * Laptops had to be personal - therefore go home with students. He claimed that costs actually go down - because there is less maintenance when the students control them. * He found that a lot of IT departments and Educational bodies based their approach on control. How could they control the students and their equipment. This approach really had nothing to do with education. * There is zero benefit in giving laptops to teachers first. This one surprised me - as I have been pushing to have laptops issued to the teachers. I thought if they had ownership it may encourage them to do more. Not according to Gary. His research found that they made a good teacher better, a great teacher greater and a bad teacher worse. At the end of Gary’s presentation I was hungry for more. I noticed he was presenting a workshop just after the keynote - so instead of going off to my alloted workshop I stayed to hear more.